Based in Monaco at port Hercule! Sunseeker Manhattan 74 motor yacht VOGUE OF MONACO’s salon has been design as a very socal area with 2 curved leather upholstered couches lining port and starboard with 2 central interconnecting coffee tables. On the port side is the stair case leading down to the master cabin. Further forward is the interior dining area to port with a couch and table. Opposite is the well equipped Galley. Guests can choose to dine inside, on the aft deck, or on the incredibly spacious fly bridge which has a barbecue, fridge and ice maker. There is also a great sunbathing areas forward and on the fly bridge. Motor yacht VOGUE OF MONACO is equipped with the latest A/V Equipment throughout the yacht including LCD TVs, Sky TV, iPod Docks, DVD Players and Sony Play station games consoles. Luxury motor yacht VOGUE OF MONACO also boasts a powerful 120hp Zodiac Jet Tender ideal for waterskiing, wakeboarding and towable toys in the warm waters of the Mediterranean sea. Cruising from port to port is easy in the Sunseeker Manhattan 74 VOGUE OF MONACO thanks to her powerful twin MAN 1,200hp engines enabling her to attain speeds between 25-31knots. M/Y VVOGUE OF MONACO has a crew of 2 who maintain the yacht to an immaculate standard. 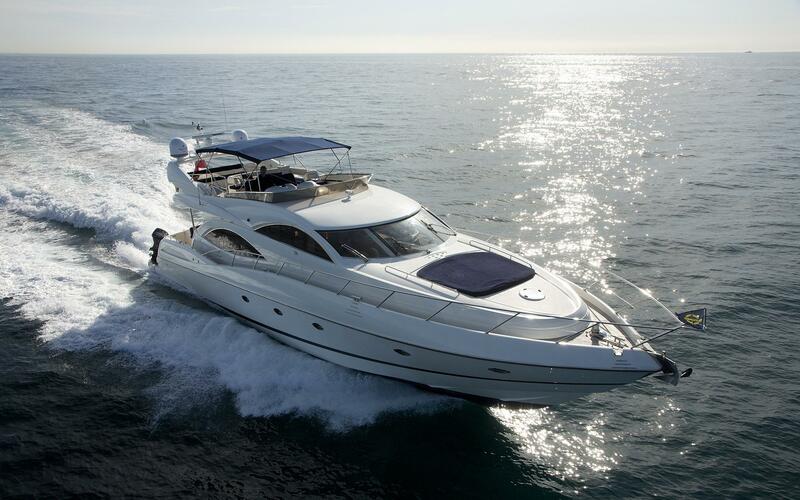 Luxury Sunseeker Manhattan 74 VOGUE OF MONACO can accommodate 8 guests in 4 cabins including a Master Cabin with king size bed and ensuite bathroom with its own separate staircase access amidships. There is also a VIP Cabin forward with queen size bed and en-suite bathroom, and 2 identical Twin Cabins with 2 single beds and one with en-suite bathroom. Motor yacht VOGUE OF MONACO has the following array of Tenders & Toys onboard: a 4.5m Zodiac jet tender with 120hp Yamaha engine, Water skis, Wake board, Banana, Donut - single and double and Snorkelling equipment. Communications onboard include Satellite telephone, Satellite fax. There is 220 and 110 electricity for European or USA appliances. Audio Visual Equipment and Deck Facilities include G6 Satellite system with Sky TV and European Decoder, Special iPod cradle in the Master cabin and on the fly, New flat screen LCD TVs in all cabins, Separate satellite TV and DVD player in Master Cabin, VIP suite's satellite TV linked to that of the Saloon, Separate DVD and Sony Play station and DVD in both Twin cabins. On the Fly bridge there is a barbecue, ice maker, drinks chiller, dining area and sunbathing area. There is also a sunbathing area on the foredeck.